That small handful of nuts is perfect for a mid afternoon snack when your body is crying out for protein. Better yet, have a small handful of these Sweet and Spicy Walnuts. They are easy to make and fabulous to snack on. But size matters, especially for serving size, so a small handful is all you get. All nuts have a different nutrient profile, but the bottom line is they all contain heart healthy fats, fibre, vitamins, minerals and disease reducing antioxidants, so eat your nuts! 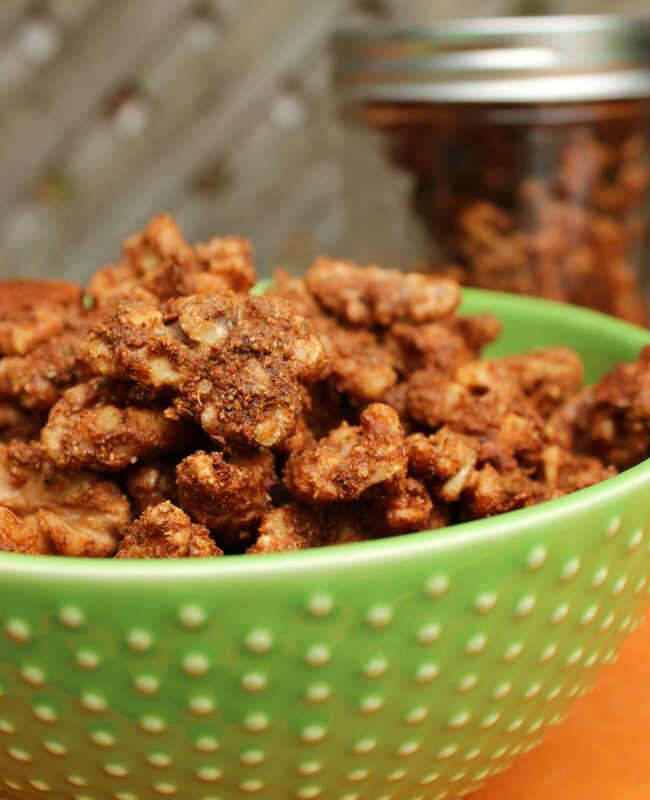 See the recipe below for Sweet and Spicy Walnuts and here’s the video on how to make them. Walnuts are my favourite nuts, not only because of the flavour but because they provide more heart healthy omega-3 fatty acids than any other nut. Adjust oven rack to the middle. Preheat oven to 350°F (180°C). Line a 9×13-inch (3.5 L) rimmed baking sheet with parchment paper. Set aside. In a large bowl whisk together the cumin, coriander, paprika, cracked pepper, cinnamon and cayenne till well combined. Add maple syrup and whisk together till thick and well combined. Add walnuts and using a rubber spatula mix till the nuts are really well coated. Pour out onto prepared pan. Spread them out into one layer. Place in oven and roast for 14-16 minutes or until the nuts are dry and crispy looking. Don’t let them burn, so check at 10 minutes to see if they are browning on the bottom. If they are carefully pick up the edges of the parchment paper and roll them around. Or if that sounds too complicated, try using a flipper to flip the nuts around. Return to oven. When done remove from oven and leave on baking sheet till completely cooled. Toss to break up any that are sticking together. They need a day to let the flavours really meld, but if you’re in a hurry just make sure that they are completely cooled. Store in an airtight container for up to 3 weeks. Love, love, love this recipe! These nuts have become a staple in our house. I bag them up in snack size freezer bags so we know were getting exactly the right amount each time. A couple of weeks ago we had company and I put a bowl of these out for people to nibble on and 2 things happened: 1)they disappeared in no time and 2)everyone kept asking where I bought them!